Taylor B. Stockdale wrote an editorial for the September 30, 2008 Wall Street Journal titled Debates Don’t Always Reveal Character. It’s a lead up to the first scheduled debate of the 2008 election Vice Presidential candidates, Governor Sarah Palin and Senator Joseph Biden. 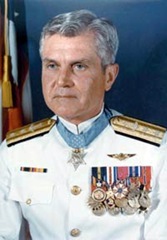 Stockdale’s father was ADMIRAL James Stockdale who ran as Vice President on an Independent ticket with Ross Perot in 1992. The Admiral was a fighter-pilot ace, Medal of Honor recipient, John MCain’s senior officer and a Vietnam Prisoner of War. Author Jim Collins wrote extensively about ADMIRAL Stockdale in his classic business bestseller,Good to Great: Why Some Companies Make the Leap… and Others Don’t holding him out as an example of a leader willing to confront the brutal facts of the situation at hand. Taylor Stockdale recounts the surreal experience of attending the 1992 Vice President debates which in addition to his father included Dan Qualye and Al Gore. Anyone over 30 will probably remember the spectacle. Messrs. Gore and Quayle were engaged in a bitter battle when, late in the race, my father accepted Ross Perot’s invitation to be his running mate. That decision created a rare, three person vice-presidential debate. In an attempt to introduce himself to the American people, my father began with the philosophical questions “Who am I? Why am I here?” But as the evening wore on, he struggled. Watching that debate from the front row in Atlanta was a surreal experience. My father, a bona fide war hero, was trying to adapt to a format of discourse utterly foreign to him. He’s right. I watched from a hotel room in New Orleans where I was on a business trip. It’s one of those events that you just don’t forget. Here’s a video of each of the candidates opening statements that definitely worth watching. Stockdale, a decorated war hero and accomplished academic, was obviously an intelligent man; however, throughout the evening’s debate he had that deer in the headlights look and an ineffective debate technique. You could not help feeling sorry for him. But what struck me in watching this video is how little time has changed things. The same political rhetoric plays today; just insert your candidate of choice. It was particularly interesting to hear Al Gore say the “real discussion tonight is going to be about change.” Sound familiar? Gore goes on to cite our “environmental crisis, health insurance crisis, substandard education” and that he and Bill Clinton would change all of that. Well, unfortunately despite eight years leading the country they didn’t so the next batch of candidates can recycle that language. And yet on this particular evening in 1992, the country saw someone who looked confused and weak. Without knowing who he was or what he did for his country, most Americans turned off their TV sets and formed an opinion of him based on a 90-minute debate. So while Mrs. Palin’s background and political acumen are completely different from my father’s, she and her family are going through an experience I recognize. They are trying to define themselves in a time-span, within a loaded political context. From personal experience, I doubt if someone can really be known in this type of atmosphere, and I empathize with her family members who suddenly have to explain things that shouldn’t need explanation. Tagged with debate, Election 2008, Wall Street Journal.